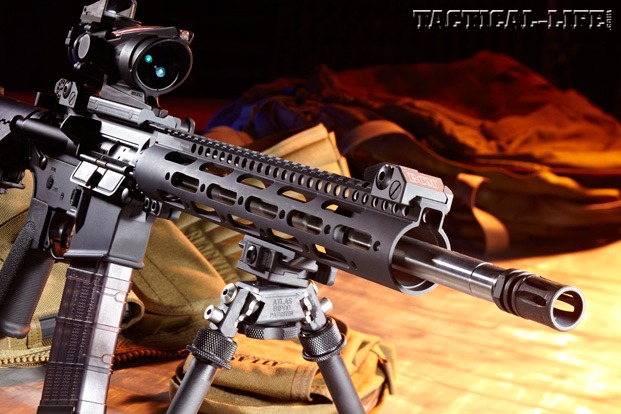 The Bravo Company Recce-16 Precision 5.56mm is an ultra-accurate, fast- charging AR designed for long-range engagements. It’s sad to say, but today’s generation of shooters knows little about Col. Townsend Whelen’s exploits. He passed away 50 years ago and his writing in the pages of Field & Stream, Outdoor Life, Sports Afield, American Rifleman and other magazines has long since yellowed with age, but his phrase “Only accurate rifles are interesting” is timeless. By my latest tally, approximately 95 companies now build AR-platform rifles, and I’ve had the pleasure to test and evaluate scores of these rifles. Borrowing from the great writer’s phrase: Only accurate ARs are interesting. 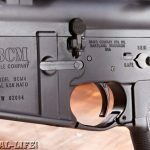 When I got the chance to punch some paper with the latest offering from Bravo Company Manufacturing (BCM), it performed to a level that might have prompted Col. Whelen to request that someone keep the loaded magazines coming. 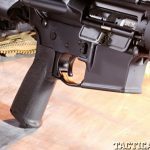 Bravo Company is a one-stop shop for professional-grade AR-platform weapons and accessories, so company President Paul Buffoni built a pre-production Bravo Company RECCE-16 Precision carbine chock full of new BCM accessories as a showcase for this issue of Black Guns. The most obvious change to the newest version of the Bravo Company RECCE-16 Precision is Midwest Industries’ SS Series mid-length handguard. The Generation 2 (G2) version is a slim-line rail that measures slightly more than 12 inches. This rail is very sleek, with horizontal vents that that excel at barrel heat dissipation. Its trim tube diameter also provides greater hand control. 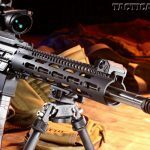 The handguard features a T-marked Picatinny top rail, and three Picatinny rail sections come with the rifle to give additional accessory mounting options. Buffoni shared that he selected a 1-in-8-inch twist rate to offer a wider range of ammunition compatibility. This twist rate works well with bullets weighing 55 to 80 grains. As you might guess, the chamber is reamed to 5.56mm NATO specifications. 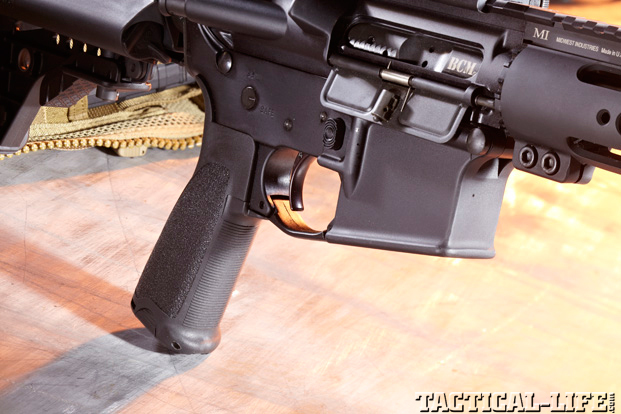 The barrel extension has an M4 feed ramp, which extends into the M4 feed ramps milled into the upper receiver. 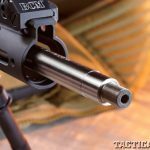 Tipping the muzzle is a standard mil-spec A2 flash suppressor. 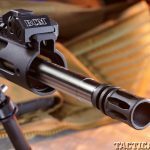 Normally, the Bravo Company RECCE-16 Precision is shipped with a mil-spec semi-auto fire control group, but Buffoni elected to upgrade to another trigger group sold by Bravo Company. 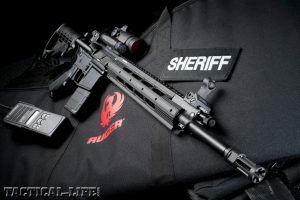 This rifle came with a Geissele Super Single Action (SSA) Enhanced fire control group. As expected, the Geissele trigger was silky smooth on the take-up and broke like a glass rod at precisely 4.5 pounds every time. 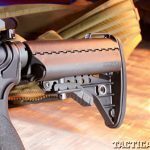 A Magpul MOE enhanced triggerguard provided a little more trigger finger room, which is a plus when shooting with gloves. This rifle wore a Vltor IMod stock, which is a relatively new design. “The receiver extension tube is mil-spec 7075-T6 aluminum,” Buffoni said. “About 90 percent of commercial receiver extension tubes are made from softer 6065 aluminum extrusions. The 7075-T6 receiver extension tube is an impact extrusion, which compares to the 6065 commercial tubes that are simple extrusions squirted out of an extruder like Play-Doh. 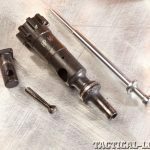 These 7075-T6 tubes cost us two to three times as much as a 6065 tube would cost.” In addition, BCM adjustable recoil spring tubes are machined with six adjustment holes, whereas mil-spec M4 tubes come with five holes, according to Buffoni. The M4 locking nut, mating the receiver extension tube to the lower receiver, is staked per mil-spec, too. 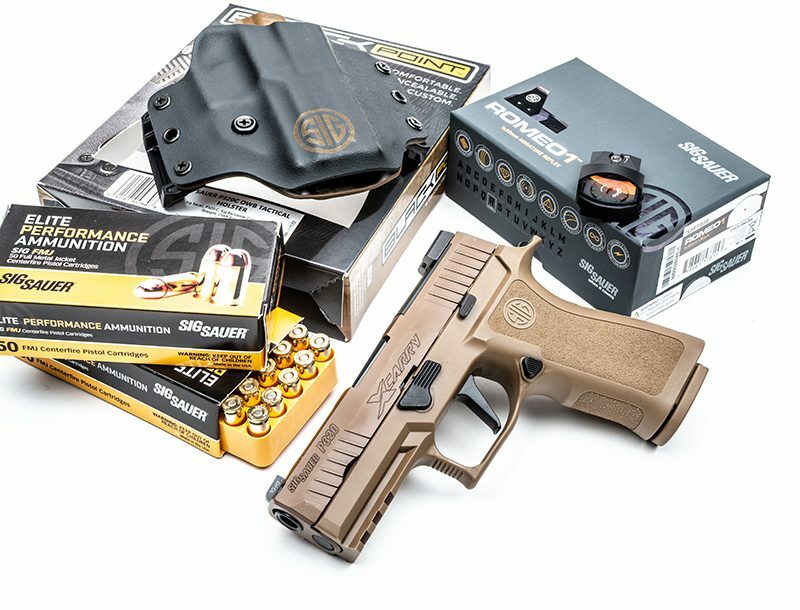 The next accessory on the Bravo Company RECCE-16 Precision that is a new product for Bravo Company is its BCM Gunfighter enhanced pistol grip. This grip features a wraparound textured surface and horizontally ribbed forward area, which provides a “sticky” handhold wet, dry, hot or cold. The end of the grip houses a trapdoor to create a handy storage compartment. 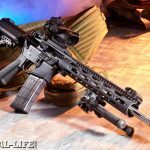 Bravo Company RECCE-16 Precision rifles usually don’t ship with iron sights, but Buffoni added a set to the model tested. 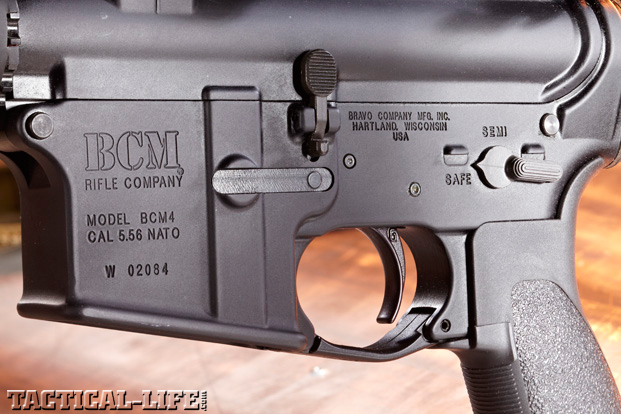 The set included a BCM-marked Troy Industries flip-up rear sight. This same-plane aperture allows for perfect co-witnessing with red dot and holographic sights. This rear has a full windage-adjustment knob located in same position as standard M16A2, A3, A4 weapon sights. Each click equals 0.25-MOA (M16A4 rifle) and 0.33-MOA (M4 Carbine) shifts in impact. The sight is easily installed and deployed by simply pulling up—no levers, buttons or springs. In the up position, a stainless steel cross-lock provides 1,000 pounds of shear strength. 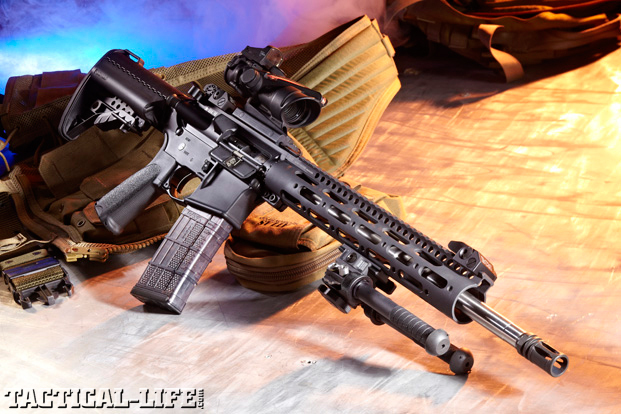 Any AR exposed to high round counts over short periods of time is going to wear quickly. “If the build isn’t completely mil-spec, it’s going to wear out really fast,” Buffoni said. 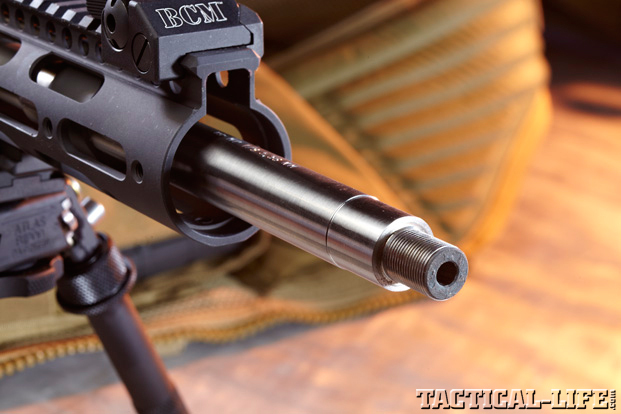 Examples exist of commercially manufactured bolt carrier groups made from 4140, 8620, or 9310 steel. Bravo Company uses a different grade of raw steel. “One example of the raw material that we use is Carpenter 158 steel in the bolt,” Buffoni said. “That is what the military requires for their bolt, and it is very expensive. It is carberized and heat-treated to mil-spec. You want a hard bolt, but not a brittle one. Our bolts follow the mil-spec standard. 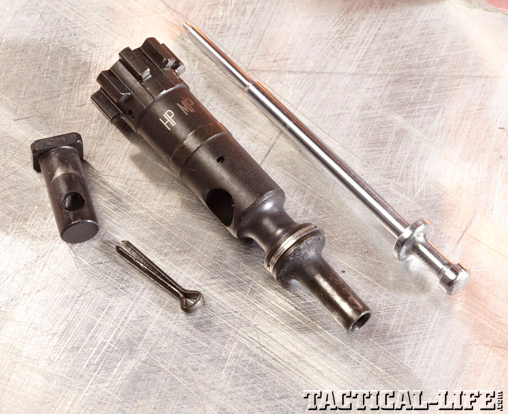 They’re shot peened, and mil-spec requires that this process is done over a very specific time period and method. Some of the commercial gun builders are using MIM [metal injection molded] bolt extractors. We use stronger extractor springs, and the stronger black extractor spring buffers instead of the blue M16 buffers, too.” The bolts are high-pressure tested with proof rounds and then MPI (magnetic particle inspected) evaluated for signs of stress fractures. Obviously, only perfect bolts pass muster. 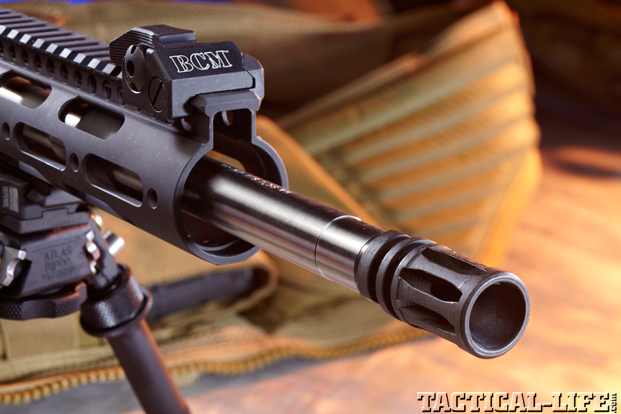 BCM bolt carriers differ significantly from commercial-grade assemblies. The carrier is an M16 chrome-lined unit. The gas key is hardened to USGI specifications, as well as being chrome lined. The benefit of hardening the gas key is that it mates well with the Grade 8 hardened fasters so that when the fasteners are torqued down they won’t impart stress that might fracture a non-hardened commercial gas key. The fasteners are also staked per mil-spec. 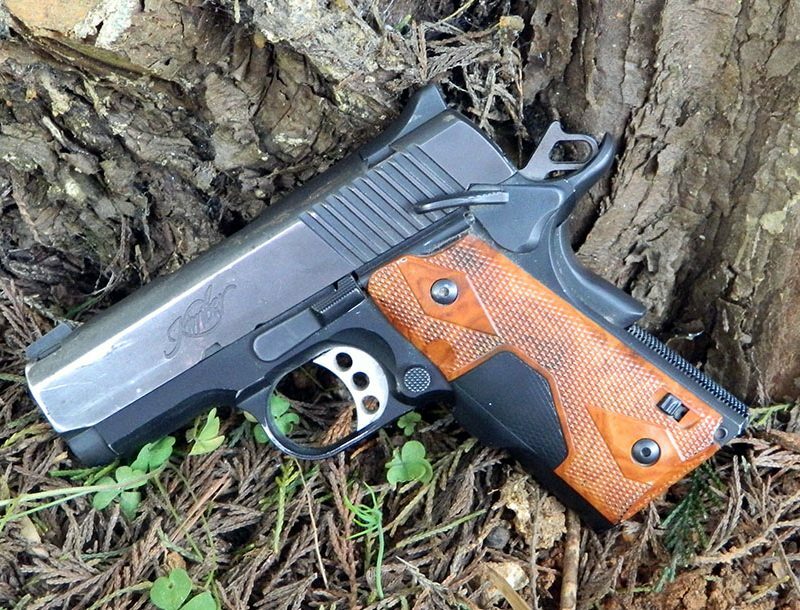 The lower receiver is also 7075-T6 forged aluminum with the same anodizing. 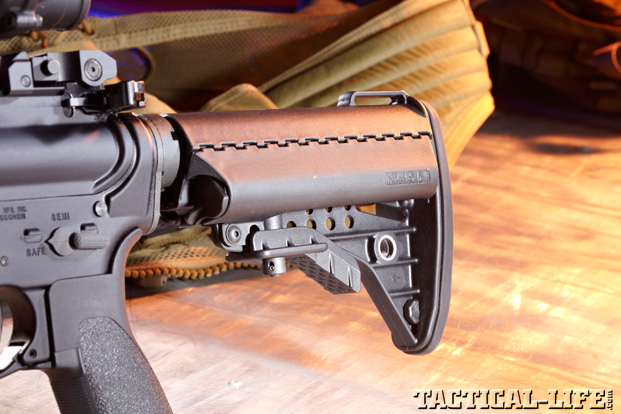 It has a low shelf inside the trigger well for RDIAS installation of an NFA-registered drop-in auto sear, which will allow the weapon to fire fully automatic. An un-notched hammer is compatible with 9mm use. Fire controls are marked “SAFE” and “SEMI.” Lastly, a USGI H-buffer rounds out the lower receiver unit. In order to charge a carbine, current CQB techniques have the operator racking the charging handle to the rear using their support-side hand only. “This is done in one swift and strong movement,” Buffoni added. “With the operator’s firing grip maintained, the weapon again has a loaded chamber, and the shooter can immediately bring a hot weapon back into a fight. The current use of extended tactical latches has made this movement much more efficient. The only drawback is that all the force used to rack the charging handle rearward goes into the extended tactical latch and is then transferred into the roll pin. With this scenario, the entire operation becomes contingent on the sheer strength of this tiny 0.06-inch roll pin and its ability to take continuing blows. Repeated and forceful support-hand-only racking of the charging handle eventually can lead to breaking the roll pin and losing the latch completely. With the latch blown out, the charging handle will not stay secured to the receiver as the bolt is moving back and forth during each cycle of the weapon’s action…a bad situation on a two-way range. “Initially, we mocked up a couple prototype solutions, but in conversations with personnel at Vltor, they were able to develop a better design at a better price for the consumer.” The result of the collaboration is the BCM Gunfighter charging handle. Its extended latches feature internal redesigns to direct the force off the roll pin and into the body of the charging handle during support-hand-only manipulations. 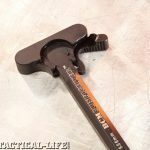 This new design has a built-in backstop engineered into the extended latch and into the charging handle. As the latch is opened, its travel is limited by these flat-surface backstops. With this travel-limiting feature, the stress is now redirected into the entire body of the charging handle for smoother operation. To run the Bravo Company RECCE-16 Precision through its paces, I mounted a Trijicon 5-20X AccuPoint to the rifle with Trijicon rings. I mounted an Atlas bipod to the handguard, and used rear sandbags to stabilize the rifle on a bench. The weather was hovering around 30 degrees, so I cranked up the wood stove in my cabin and shot from an open window to my 100-yard backstop. Chronographing was conducted with a Shooting Chrony Beta Master. As is my normal practice, after shooting several five-shot groups, I swapped out the higher-magnification AccuPoint scope for a 4X ACOG. I ran several 30-round magazines with a wide mix of odd 5.56mm NATO and .223 ammo while shooting at reactive steel targets. The Bravo Company RECCE-16 Precision digested 300 rounds over the course of 10 minutes without any feed problems. I tested two Federal Gold Medal Match loads loaded with 69- and 77-grain Sierra MatchKings, respectively, and Hornady’s “Zombie” 55-grain Z-MAX load. While the Z-MAX ammo was the fastest, the 69-grain Federal Gold Metal Match load produced the smallest five-shot group, measuring 0.79 inches. The Zombie load had a tendency to throw one round outside of a small four-shot cluster when shooting five-shot groups. I did manage to produce a 0.87-inch group, but its average opened up to about 1.27 inches. Groups with the 77-grain Federal averaged 1.1 inches, so this is a very accurate rifle. Accurate reliability in harsh environments is a hallmark of the Bravo Company RECCE-16 Precision carbine due to the inherent ruggedness of its assembled parts. 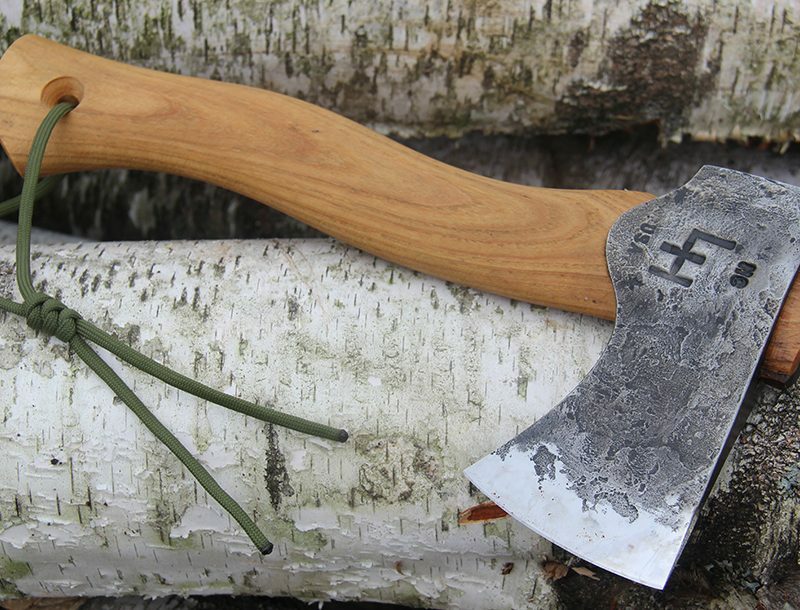 When you must go into harm’s way, carrying a weapon of this quality should be a definite consideration.